Dwelling underground in the dark and twisting sprawl of their tunnels, kobolds make unlikely heroes. 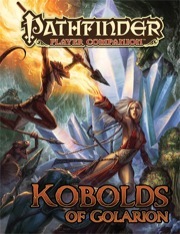 Pathfinder Player Companion: Kobolds of Golarion unlocks the potential of this cunning and skilled race, showing how the talents kobolds have trained in since birth—trapmaking, teamwork, and sneakiness—make them excellent dungeon delvers. Unlike some of the less intelligent creatures that share the Darklands with them, kobolds make allies among the surface races and exert influence in many of Golarion’s cities. Though they’re limited within their rigid tribal rules, kobolds have the ambition of dragons! Many of the character options in this book can work for other types of characters who want to use traps or fight in the same style as kobolds. Others relate directly to the unique parts of kobold life, such as the significance of the way their scales mimic the hues of the chromatic dragons. Bring this reptilian race’s best skills into the adventuring life with Pathfinder Player Companion: Kobolds of Golarion! A look into the tightly ordered kobold tribes that live in the Darklands—their life cycles, worship, and cultural behaviors—and an overview of several specific tribes that have risen to prominence on Golarion. More tools to build an interesting kobold character, from archetypes and feats to random kobold characteristics and traits. Insight into the spiritual lives of kobolds, including the deities they worship, the sorcerous talents they excel at, and the dragons they revere. The tools of the kobold trade, including an easy-to-use system for traps, a plethora of magic and alchemical items, and several trapped decoys! This Pathfinder Player Companion is intended for use with the Pathfinder Roleplaying Game, but can easily be incorporated into any fantasy world. Written by Tork Shaw, Mat Smith, and Jerome Virnich. Cover Art by Dan Scott. Read my full review on my blog. Kobolds of Golarion is a delight to read. It’s both informative and entertaining. It provides an illuminating insight into the kobold mindset and society, while also providing a wide range of new options for kobold characters, many of which can easily be used with non-kobolds as well. 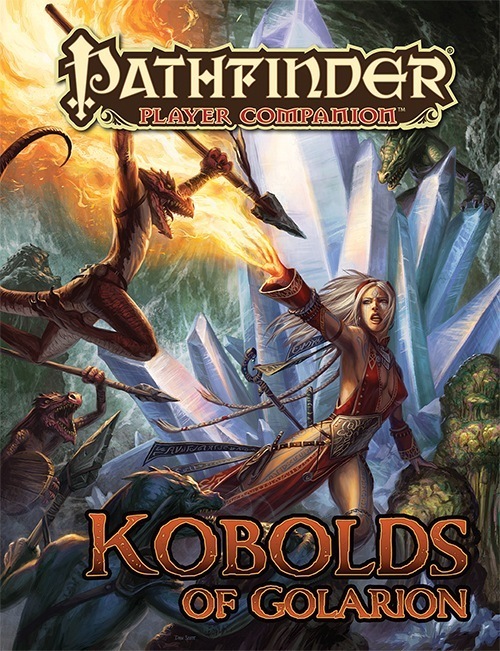 As a Player Companion, the book is unsurprisingly geared towards options for using kobolds as player characters, but the material is equally usable for NPCs, making this an extremely useful resource for GMs too, even GMs who aren’t fond of the idea of players running monster races as characters. These new options take the form of archetypes, traits, feats, spells, and so on. Most importantly, the book is loaded with new options for traps—the things kobolds are well known for being masters at creating. I purchased Kobolds of Golarion the other day at my local gaming store as I often love them and Goblins as my two favorite races. Having high expectations for this book, I finally got a chance to read through the whole thing and I have this to say: Its awesome. Details on their creation (and even alternate theories as far as their species believes), information on the different-colored scales and their possible locations, even the usual Feat, Trait and Archetypes you'd find in other books (the Rogue one is something my friends have been waiting for). I love the book and I think it is wonderful. I figure others will enjoy it just as well. Huh. Someone actually listened to the fervent cries of the lowly Kobold lover? This is looking good. This was only a matter of time, really. Glad to see it finally on the schedule. I lurvs me some Kobolds too. Just out of curiosity weren't kobolds originally dog like? kinda like the pugwumpis? When did they turn into little reptillian people with delusions of being related to dragons? That's been a weird slow transition over the years. They became egg-laying reptilians sometime during 1st Edition, so they haven't been canine for a long time, but were still described as having some "dog-like" features right up into late 2nd edition. The dragon connection came about in 3rd edition and wasn't a delusion. They actually were related to dragons. Heh. That was literally my first thought when I read the blurb. Nice. (My second thought was "finally, Kobolds"). Awesome! I already have Kobolds as a full race in my campaign, but it's nice to see them getting some love here! Wow, I didn't the scaly little cusses were popular enough to merit a Player Companion. But it'll be amusing to see what's done with them in this. Hopefully we will get an interesting origin story for these guys. Half (or even most of) the fun was the module 'We Be Goblins', though. So please will there be a kobold module to go with this? Freaking finally. Do you have any idea of how long I've waited for this?! Thanks for the reply. Yeah looking at my first edition books shows the Kobolds to be reptilian. I remember the bit of lore that kobolds were related to dragons that was added in third edition. dragon as anything other then a kobold "mc nugget". I believe that is how many dragons view them. Kobolds are scary trapsmiths if used correctly & what Dragon worthy of the name doesn't have a horde they want protected. Would be an excellent Free RPG Day candidate! Thank you! And just in time for my 35th birthday! Squeee! We have two playing in our Kingmaker campaign right now. See the above poster. I dearly hope that Paizo's FRPGD offering for 2013 is an all-Kobold scenario by Sir Pett! Kobolds! I love kobolds! I remember playing a silver dragonwrought kobold scout in an Eberron campaign. The scout class plus a flyby attack was awesome. I hope this product includes some tips/options on upping their power level. They are currently the weakest of the "player friendly" choices. The only way they were playable in 3.5 was because of the dragonwrought feats. +1, I forward the motion. ... then why post at all? Aha! Anything vaguely devilboxish would be a joy to work on, and those lovely paizo folks know I'd be delighted. I'm still humbled by we be goblins doing so well after having to take care of James' children so carefully. +2 to We be Kobolds. I totally heard that it's going to be My Little Bonies, a scenario where everyone plays undead magical ponies. Not My Little Necrobronies, where you play undead men who are in love with undead magical ponies? So help me, I would buy this. Then again, I'd buy Ponyfinder. We didn't really get an iconic goblin or orc or tiefling or aasimar with their respective 'Foo of Golarion' books, so I suspect not. Although it would be cool. I don't recall a 'name' kobold since Meepo. That will be in 'Kinks of Golarion,' for the mature Kinkfinder line, which has been pushed back to the fifth quarter. I'm intrigued to see how a <Creatures> of Golarion book will fit in with the new format. Anyone in the know got some hints for us? I am intrigued somewhat as to what or who kobolds in Golarion generally worship. Classic Monsters Revisited suggested Asmodeus, for some (a subset of a subset, anyway), but I didn't really 'feel' that connection. Dahak is a bit chaotic for such a lawful race. The other 'common' LE god, Zon-Kuthon also has an odd vibe, for kobolds. Devotion to Achaekek and kobolds, from the mention of their interactions on Mediogalti, don't seem to mix together well. There are a few demon lords that seem more appropriate (Andirifkhu, in particular), but demon lords seem to be more likely to have chaotic followers (like boggards, troglodytes, gargoyles, trolls, werewolves, etc. ), than lawful ones. While I generally prefer using pre-existing gods, rather than having different racial dieties, this might be a case where the pre-existing crop of gods doesn't particularly suit this race/culture. Well, there are Char, Black Tail, Ghost, Klikjack, and Dractus in the Forgotten King's Tomb (released this week). That's 5 somewhat-iconic kobold PCs. Seriously, if FKT doesn't tide you over until the Kobolds in Golarion release, I don't know what will. We kinda do have iconic goblins with We be Goblins. Sweet simpering Reptilians! Why must this book be so far away?